Dondolo of Carrollton, Texas, is recalling about 3,100 children's nightgowns and two-piece pajama sets. The garments fail to meet the federal flammability standards for children’s sleepwear, posing a risk of burn injuries. This recall involves children’s 100% cotton woven, nightgowns and two-piece, long-sleeve top and pant pajama sets. The nightgown has a peter pan collar with a red and white gingham pattern trim with six plastic buttons on the back. The two-piece pajama set is traditionally styled with five plastic buttons on the center-front of the top with two pockets placed near the waist of the top. 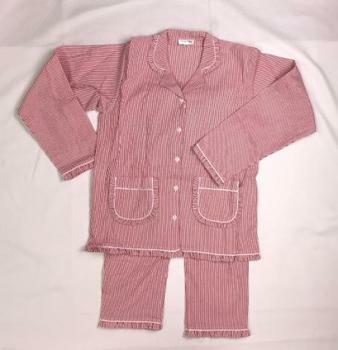 The pajama sets were sold in striped light blue, striped navy, striped red, striped pink, and lavender. The garments were sold in sizes 12 months, 18 months, 24 months, 2T, 3T, 4T, 5, 6, 7, 8, 9, and 10 years. The garments, manufactured in Colombia, were sold at children’s boutique stores nationwide and online at www.dondolo.com from November 2014, through October 2017, for between $15 and $50. Consumers may contact Dondolo at 800-659-5370 from 9 a.m. to 5 p.m. (CT) Monday through Friday, by email at recall@dondolo.com or online at www.dondolo.com and click on “Product Safety” for more information.